From the day following the earthquake, “road clearance” works (Operation “Teeth of a Comb”) were started. The road clearance works secure a route just wide enough for a car to get through. In the midst of fear of aftershocks and another tsunami, the site managers of construction companies and the road administrators considered the road clearance works to be their mission. They wanted to do anything to help out the affected area. They determined to undertake the road clearance works, and dedicated themselves to the works. 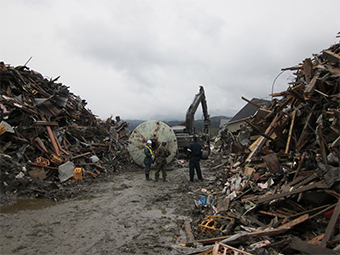 The road clearance works were completed much earlier than the original schedule, thanks to the collaboration with the JSDF, the police, and both prefectural and municipal organizations concerned, which took care of the bodies found during the clearance works. Operation “Teeth of a Comb” was carried out. A mission to clear the Road of Life. No moment to lose. Operation “Teeth of a Comb” was a road clearance operation to secure rescue and relief routes on a number of national highways extending from inland toward the Pacific coastal area of Tohoku. The operation was named after the shape of the road network under Operation, where the Tohoku Expressway and Route 4 run inland Tohoku from north to south, and a number of debris-covered roads to be cleared extend from the expressway and Route 4 toward the coast. The inconceivably huge tsunami devastated the areas along the Pacific coast of Tohoku, leaving many areas isolated by debris-covered roads and swept bridges. Immediately after the earthquake, the Bureau leaders and staff gathered in the Disaster Risk Management Office of the MLIT Tohoku Regional Bureau. Communication with the road and highway offices and braches was established soon to gather information on the damage, and the strategy had been worked out. Operation “Teeth of a Comb” was immediately carried out to clear the roads and secure the Road of Life. 11 routes were secured in two days. We cleared debris from the roads, removed bumps, and secured rescue and relief routes. Secure routes to save lives of many injured people, and to deliver relief supplies to the disaster-affected people. Under Operation “Teeth of a Comb” that was worked out immediately after the earthquake, the “road clearance” works were carried out. What are the road clearance works? They clear debris or other obstructions from the road. 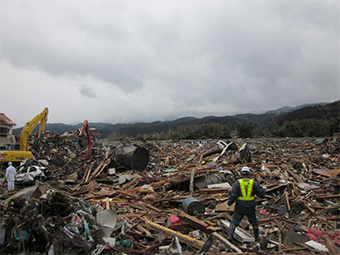 The prefectural office staff, the members of the JSDF, the workers of local construction companies, and the MLIT Tohoku Regional Bureau staff - they worked as a team, and pushed their way through the debris. In the midst of fear of aftershocks and tsunami warnings, they dedicated themselves to the work, just “hoping to save as many lives as possible”. On the March 12, the following day of the earthquake, 11 routes were secured; then, 15 routes on March 15, allowing emergency traffic, including ambulances, the police, and the JSDF. Medical teams were also able to reach the affected areas. Relief supplies were delivered to where needed. Secure the longitudinal routes, i.e. the Tohoku Expressway and Route 4. Secure the transverse routes extending from the Tohoku Expressway or Route 4 toward the Sanriku coastal area. Mar 12, 11 routes (east-west) were secured. Mar 14, 14 routes (east-west) were secured. Mar 15, 15 routes (east-west) were secured. The road clearance works were almost completed by March 18: 97% of Route 45 was reopened to traffic, etc. From March 18, the project proceeded to the temporary restoration phase.